This entry was posted on Monday, December 30th, 2013 at 10:32 pm. You can follow any responses to this entry through the RSS 2.0 feed. Both comments and pings are currently closed. A hit, a palpable hit! Writing is an excellent way to keep the opponent off-balance–may there be much more of it! Best of all to you. Happiest of new years when this cancer thing has been driven out. Bam! Pow! Many thanks! We’ll zap it with pure science! , and mostly, avoiding being in contact with too many people to minimize danger of infection. 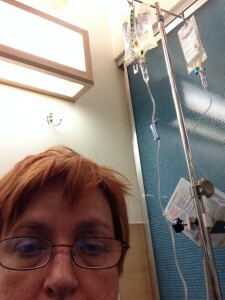 Body is at low, and infection leads to chemo pause= not good! So lots of skyping :). Also, no cut flowers, as they produce a lot of spores. We just gave ours away to the neighborhours! It will be fine, writing woul should take care of the tedium times. Hope the chemo is gentle on you and tough on the cancer. Oh man, my husband and I just got back from his third infusion. He’s trying to do it without a port… we’ll see how this goes. One thing to know is that they can dilute the dose – give you extra saline along with it – or drip it more slowly. The more slowly made a difference. Seconding the idea of trying to avoid germs. Your whole immune sstem is taking a big hit. I’ve stashed hand wipes in the car, in Tom’s office on campus, by the front door. Ordinarily I don’t do the cover-the-earth-in-antibiotics thing, but this is the time to do it. Also – very Berkeley and all – we’re doing acupuncture (residual surgery pain) and astriligus and Reishi mushrooms. Might help.